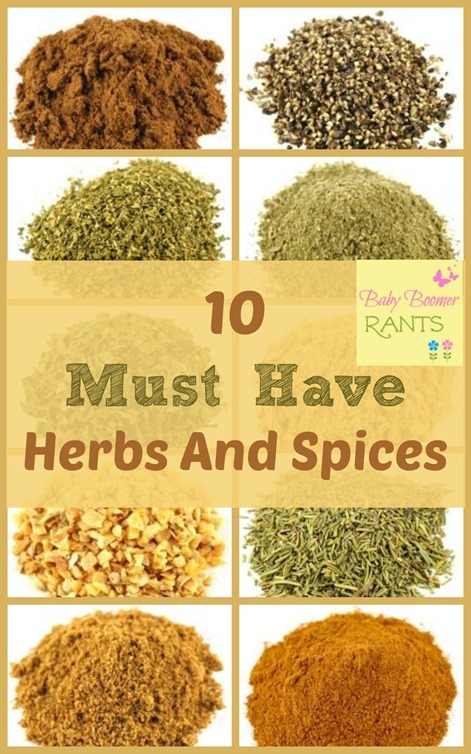 10 Must Have Herbs And Spices! You are here: Home / Family Living / Household Hacks / 10 Must Have Herbs And Spices! So, I was looking at my spice rack and my spice cabinet and what a huge disarray they are in and decided to clear out spices I don’t use. Like I said I hate to throw them away so I just put them in a less prominent place so I could still get to them if I ever needed them. So, I pared down to 10 herbs and spices I always keep on hand. Some of them I use all the time and some I try to incorporate when I can because they have health benefits. Used in, but not limited to Italian, Mediterranean, and Mexican dishes. The oils in Oregano are said to inhibit bacteria growth. Two of it’s uses are as a marinade, and made up as a tea. Ginger is known to settle the stomach. My Midwife always suggested it for morning sickness when I was pregnant. I love to use Garlic in many dishes, from soups and sauces to marinades. Garlic is said to have many great health benefits, too. Among many other health benefits, it has been known to help regulate blood sugar levels and help with lowering blood pressure. Sage is a good addition to sauces and as a seasoning in marinades for chicken and pork. This is another one that is said to help lower blood sugar as well as helping to heal a sore throat. Rosemary is best used in hearty stews and soups, as a seasoning for meat and vegetables. Rosemary has long been said to be good for memory. Cinnamon toast was a favorite of all of our kids, they would mix cinnamon and sugar and then mix it in the butter to go on their toast. It’s also good in coffees and teas as a special treat. Cinnamon is another one said to help lower blood sugar and reduce cholesterol. Cumin is good in Indian and Mexican dishes. It is said to help aid in digestion, too. Allspice is another one that is good in Indian and Mexican dishes. It also is said to aid in digestion. It is even known to help with muscle pain and Arthritis. Pepper is used in everything from soups, sauces, and marinades to dry rubs and table seasoning. Black Pepper is said to increase metabolism and energy levels. What’s in your spice rack or cabinet? Parsley is one of the world’s most nutritious herbs with hardly any taste, Don’t waste it as a garnish, put it in every dish you cook!! Good advice! I know they put it on your plate at the restaurant for “looks”, but, I have also heard you can eat after your meal to freshen your breath! Parsley is great for relieving acid reflux. More than a handful a day can be toxic. I use parsley and ginger to keep my acid reflux under control … better than prescriptions that have side effects worse than the problem.